Contact us today to see if your organisation qualifies for a Free IT Health Check. 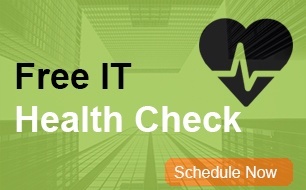 Free IT Health Check & Audit. To find out if you qualify, contact us today. A list of key risk areas which have the potential to cause system wide downtime. General security review – including endpoint security, anti-malware, perimeter firewall protection, scan of external ports, passwords, admin rights, and availability of information security policies. A review of disaster recovery & business continuity plan. A review of system performance - including a review of the system as a whole, to identify areas which may be limiting performance. Security updates & patch audit. Following the audit and health check, we will provide you with an independent, detailed report of your current IT and technology infrastructure. We will also highlight any areas for concern and the report will be provided in a RAG (Red, Amber, Green) format. This service has a value of £795.00 and we can only provide a limited number of these health checks every month. Please call us today on 01908 571510 or complete the form to see if your organisation qualifies.